The royal tiara, high and flat in front, the diamond-thunderbolt (vajra), attribute of the god, above the left shoulder and falling from one of the lotus flowers, the horizontal frontal eye, all immediately identify the god as Indra, the king of gods in Brahmin tradition. This god, recognized by Hinduism and Buddhism alike, is also one of the eight guardians of the directions (dikpala) on the edges of Mount Meru, the mountain at the center of the world. Indra protects the East, the most auspicious region. This god is especially honored in Nepal. In Newar country, both Hindu and Buddhist worshippers believe he has the ability to bring on consequential monsoons, thereby guaranteeing good future harvests. In Kathmandu, since the 17th century, his festival, Indrajatra, combines the worship of several gods and links both religions to the sovereign. The procession, which is the highlight of the religious festival, survived the fall of the Malla Dynasty (1768-1769) and was perpetuated throughout the Gurkha era. Newars from the Kathmandu Valley created a new iconography unknown in India, one which depicts the god sitting in the royal ease posture (maharajalilasana), the left leg folded on the throne and the right leg more or less straight. It is not known from when this dates. An exceptional Indra from the 12th century, once part of the John D. Rockefeller III Collection but apparently not part of his donation to the Asia Society of New York, is the oldest known example (Pal, 1975, p. 116, No. 87). Many small statues of Indra are found on the market and in public collections (for example, priv. col. and Seattle Art Museum, cf.Kramrisch, 1964, p. 66 and 67, No. 16 and 18 ; Boston Museum of Fine Arts and L.A.C.M.A, cf. Pal, 1974, No. 42 and No. 246 ; National Museum of Kāthmandu ; cf. Waldschmidt, 1969, No. 36). All were destined for family altars. The varied elegance of the pose and the gesture, the varying subtlety of the model and the quality of the gems can be used to establish a chronology. As with other conographic types of Newar art, there is a paradoxal dual tendency that weakens the forms but also accentuates their decorative aspect. The two that are most similar can be found in the Victoria and Albert Museum in London (inv. I.M. 170-1913) and in 1981 in the D.A. Latchford Collection, both published by Ulrich von Schroeder (1981, p. 362-363, No. 97B and 97C). Both date from the end of the ancient Malla era and are illustrations of a transition between the elegant art of the 14th c, with its fine gems, and the mass production of later centuries. The fine details link our Indra with that of V&A, and the languid pose to the one in the Latchford Collection. All three pieces have retained most of their mercury gilding. 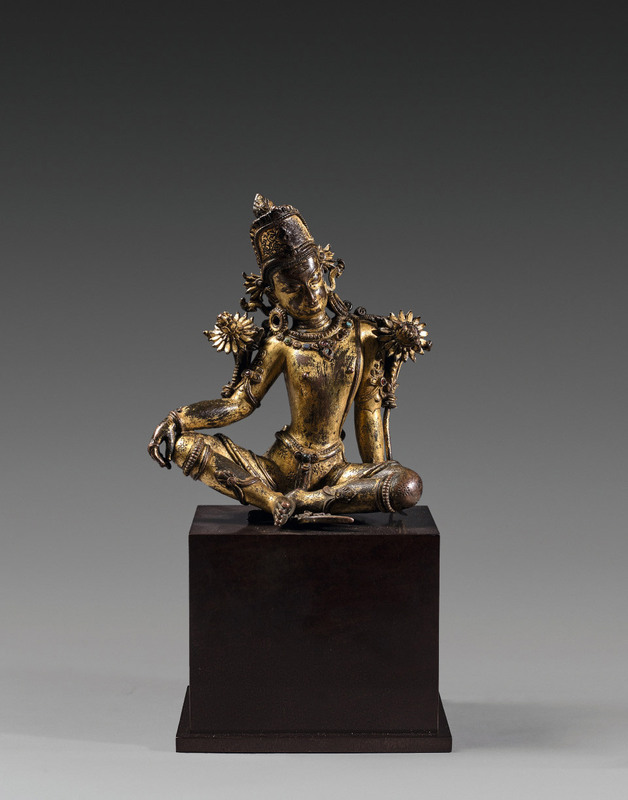 Through its elegant pose, the subtlety of its muscular torso, the affability of its smiling face, and the abundance of precious gems, this small statue of Indra is emblematic of the best Nepalese art has to offer.